It has been 4 years since our last newsletter. As you may recall, we were just preparing for the birth of our first son at the time. Logan was born right on schedule, March 25th, 2010, and our lives have never been the same since. Logan has blessed us in more ways than we could have imagined. He was a very happy and easy going baby who started walking at 9 months of age. He is now almost 4 years old and just started attending preschool this summer. He really seems to enjoy school and showing off all he learns. He knows the alphabet and phonics sounds, spells/reads many words, identifies colors and shapes, and counts all the way to 1 billion!!! Just to name a few. He also has a very impressive ability to remember and recite lines from his favorite songs and shows. Despite being delayed in communication and language skills, he is actually quite the talker! This past October, he started attending an ASD special education preschool program offered through our public school system. After just a few months, he is making noticeable progress in expressing his needs/wants, potty training, self-feeding, and interacting with his peers. We hope he continues to benefit from this program and pray God will equip us as his parents. Despite these last 4 years of harder economic times and high unemployment rates, we praise God for the very good secure jobs he has provided us. Pat was promoted to Associate Dean at PBA school of nursing several years ago. This year he worked very hard developing a proposal for a doctoral level nurse practitioner program at PBA, which was recently approved by the Board of Trustees. He also was distinguished as one of UF’s Young Alumni award recipients. Last October, Jen was able to start doing her VA pharmacy job from home (telework). Although working from home can be challenging with young children, thanks to our excellent nanny helpers, it has been working out fairly well. Jen really enjoys being able to maintain her full time career while also being able to stay connected with the kids at home during the day. With Jen working from home, living close to the VA was no longer a priority. So when the real estate market picked up last year and we were expecting our 2nd child, we felt it might be a good time to try to sell our home and relocate out west (30 minutes) to be closer to family and friends. After many months of intense house hunting and with Jen 7 months pregnant, we were almost discouraged enough to give up the idea all together. It was then, that God answered our prayers by providing a home that was as close to everything we wanted as we could hope for. Not only did the sellers accept our offer, but we would be able to move in before baby’s due date…3 weeks before. Even though that wasn’t much time, we felt like that would work better than trying to do it after the baby was born. We then put our house up for sale, and found a buyer within 24 hours! That’s how crazy the South Florida real estate market can be. Fortunately for us, it all worked and we moved into our new home as planned the last week of April. Thanks to the generosity of our friends and family who helped us, we quickly got settled in our new home. Only 1 week later, our son decided to make his early arrival. Although we were not planning on having a baby that weekend, it worked out well since Jen’s mom was already staying with us at the time and was able to be there for the birth. Needless to say, our house-warming party plans have been put on hold for awhile. For those who have not already met our newest addition, the youngest little guy there in the photo is Corban Patrick (or Corban Dallas Multipass as Pat prefers). Like his Dad, he apparently has a flair for drama and a mind of his own as evidenced by his decision to be born early on International Star Wars Day (May the 4th be with you…get it? ), rather than share a birthday with his Dad on May 15th, which was his official due date. Even though he arrived early, he was heavier at birth than his big brother was. He is a very happy boy, doing great in all areas, following in Logan’s footsteps (literally) by standing and cruising at only 7 months of age. He really seems to admire and adore Logan. Some of you may recall our “1st child” the Doberman named Glory. 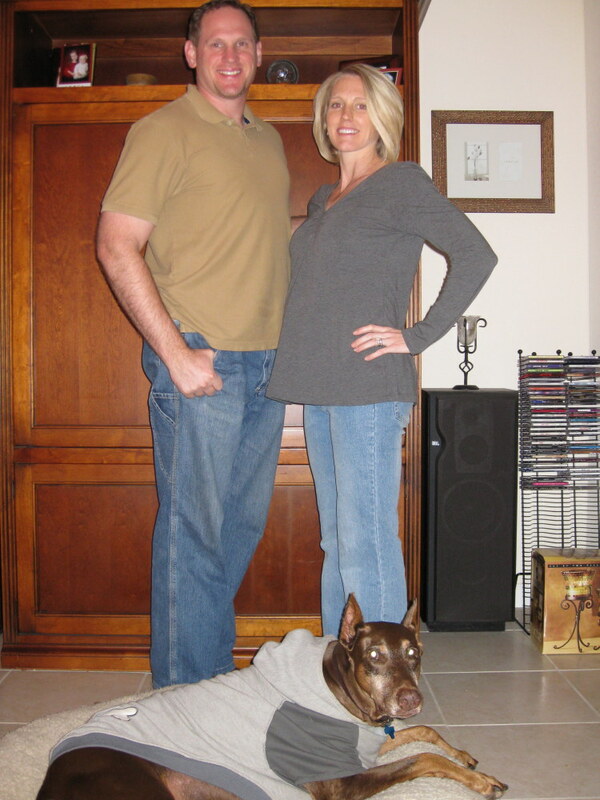 As happens to many Dobermans as they age, Glory developed large tumors on her body. One in particular was the size of a bowling ball attached to the side of her abdomen. Because she was 14, there was nothing that could be done for a tumor of that size, so we eventually made the very difficult decision of putting her down. Although she is no longer with us in body, she will always have a place in our hearts. Logan turned 3 months yesterday, wow has it been a fast three months. Jen has been making a baby photo book for him, and it’s incredible how much he has changed in just 3 months. He’s very interactive and vocal now. He flirts with the baby in the mirror, and he hits and grabs at the toys hanging from his “gym,” and to commemorate his three month birthday decided to learn how to roll over. If you’ve been keeping up with the photo galleries, there’s four so far. We hope you’ve all had a very Merry Christmas and are off to a wonderful New Year. It has been a while since many of you have heard from us, so to bring you up to date… Jen and I moved to West Palm Beach in the fall of 2003 after celebrating our first year of marriage. After completing my PhD at UF, I accepted a faculty position with Palm Beach Atlantic University in their brand new nursing program. Jen was able to transfer within the VA hospital system. Our first home was really a blessing even though it did require some major cosmetic reconstruction (we basically gutted the poor thing). However, following last year’s unprecedented hurricane season, we thought it would be wiser to find a newer concrete block home equipped with hurricane shutters. With the assistance of a very prosperous real estate market, we were able to do just that this past May. Our new home in Riviera Beach is just about perfect for us, and is only minutes from the beach and the VA hospital….a real bonus for Jen! I just completed my first full-time semester of teaching at PBA, having spent the previous 2 years doing mostly administrative activities preparing the new program. This past semester was very demanding on student and professor alike, but things will improve as the curriculum progresses. In addition to the nursing stuff, I also developed and taught Introduction to Ballroom Dance and and Intro to Latin Dance, but after three semesters teaching night dance classes, I’m taking a hiatus. In addition to relocating, changing jobs, and moving twice, we’ve also traveled a bit over the past few years. For our first anniversary, we spent a long weekend at a resort in the Bahamas. Then, shortly thereafter, we visited AUTEC on San Andros Island with my parents. In the summer of 2004, we spent a week discovering Washington State. The trip was both business and pleasure, with an academic conference in Spokane, a few days in downtown Seattle, and a few days to relax at a Bed & Breakfast in the mountains somewhere between. We had the great fortune of visiting during salmon season, making for especially “good eats”. (Good Eats with Alton Brown has become our favorite—or rather, only—TV show.) In February 2005, we went to yet another conference, this time in Atlanta. We were able to visit with quite a few of my nursing cronies who were also attending the conference, as well as our friends, the DellaVecchias, who had made arrangements to join us there. Then, in August, we visited them at their home in Durham, NC just a few weeks after the birth of their new baby girl, Ashlyn. This past October, during the weekend of hurricane Wilma, we headed out of town to Orlando, Jacksonville, St. Augustine, and Palm Coast, stopping to visit Universal Studios, our future homesite in Palm Coast, and several of our friends who also had had new babies born within the year. We were thankful to return to our new home having suffered only minimal damage from Wilma’s winds. We’ve enjoyed sharing in the joy and blessing brought by so many new little babies in these past few years. Not only have so many of our friends been starting their families, but within our own immediate family, as well. In January 2004, my brother had his first son, Samuel Joshua. And then, just this past November, they had their second, Noah Michael. Jen & I are the very proud Auntie and “Unckity” of our two nephews. For those of you out there thinking, “So when are you going to have kids?” Our response is, “maybe in 2008”. In the meantime, we plan to keep working, traveling, and dancing. We recently joined a dance studio where we have an excellent teacher and a lot of social opportunities to show off our fancy moves. As for future travel plans, we’re planning to spend a week in Williamsburg, Virginia this summer. Then, next December, we’ve got a ski trip planned to Breckenridge, Colorado. That’s as much as we have planned for now.